"Quick, easy, and less messy than real tacos. Eat with a fork and come back for seconds. Serve with tortilla chips." Heat a large skillet over medium-high heat. Cook and stir beef in the hot skillet until browned and crumbly, 5 to 7 minutes; drain and discard grease. Stir in taco seasoning. Preheat oven to 350 degrees F (175 degrees C). Spray an 8x10-inch baking dish with cooking spray. Spread crescent roll dough into the bottom of the prepared baking dish; spoon refried beans onto dough. Layer ground beef over refried beans. Wrap edges of crescent roll dough over ground beef. Bake in the preheated oven until dough is golden brown, 10 to 15 minutes. Sprinkle with Cheddar cheese and lettuce. 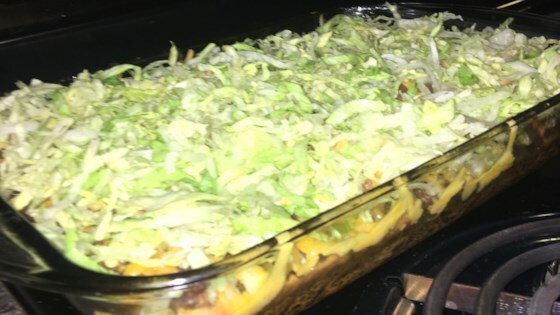 Favorite taco ingredients turned into a baked casserole. The crescent rolls did not cook completely even after several more minutes in the oven than suggested.